If I had my way, my kids would sleep in until 8am every day, and I’d be able to leisurely wake without an alarm clock and still get a nice quiet morning in before they come bounding out of their room. This is not the reality in my house, though. My little energetic loves awake by 6am and they are ready to go, more mornings than not. So, if I am to actually get in a little pre-kid quiet time, I have to set my alarm for early-o-clock, and silently sneak out of my room without actually moving the door that squeaks every time I open it. And then? Then, I have to gather all my supplies without a sound and decide what I’m reading that morning. Once I crack open my Bible, I know the kids are going to hear the pages turning because they hear everything, so I rush through my quiet time so that at least I can finish it before they wake up. If the children are miraculously still asleep, I break out my planner so I can take a look at my day. I make my to-do lists and immediately feel overwhelmed. I have every intention of doing a video workout after that, but I quickly abandon that idea – either because I take a look at my lists and already feel behind, OR because the littles are awake and clamoring for cheerios. So much for a productive morning, right? Does this morning routine sound stressful to you? Because it felt stressful to me. And I don’t know about you, but for me, the ENTIRE POINT of a quiet morning is to focus on the Lord and give HIM my stresses and worries for the day! You guys. It wasn’t working. I needed something different. I needed simple. A simple way to get in the Word every morning without debating which study I’d be using that day. A simple way to focus on my priorities before the day began. A simple way to make a little progress on my wellness journey each day, even if I didn’t get in a full workout. I wanted just one place where I could fit in all of these things, stay focused, and actually stick with a morning routine that gave me what I needed so that I could greet my family with joy each morning. I thought you might want something like that, too. So, I’m excited to share something new with you! The Simple Start Journal: A morning journal for busy women. I’m so thrilled to share this journal with you, because I have used it and IT WORKS. Let’s take a look! 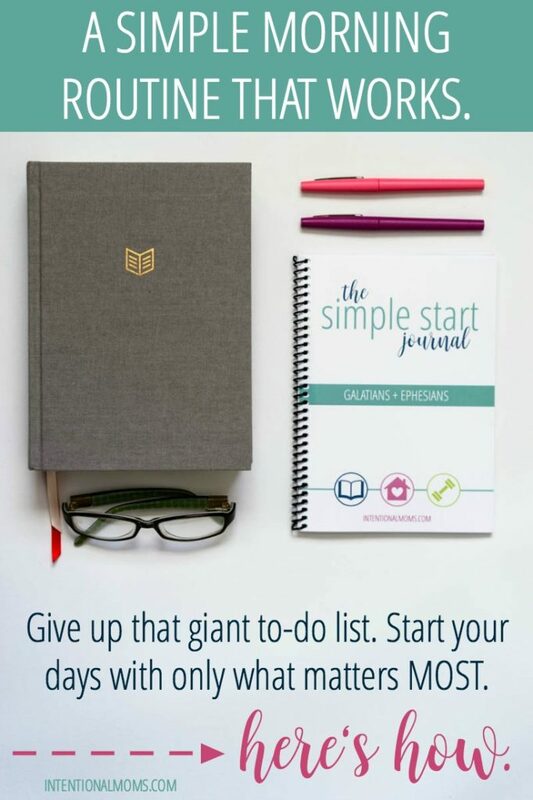 The Simple Start Journal is a morning journal for busy women. It’s the simple, straightforward resource you need to be able to do the things that matter most each morning of the week. 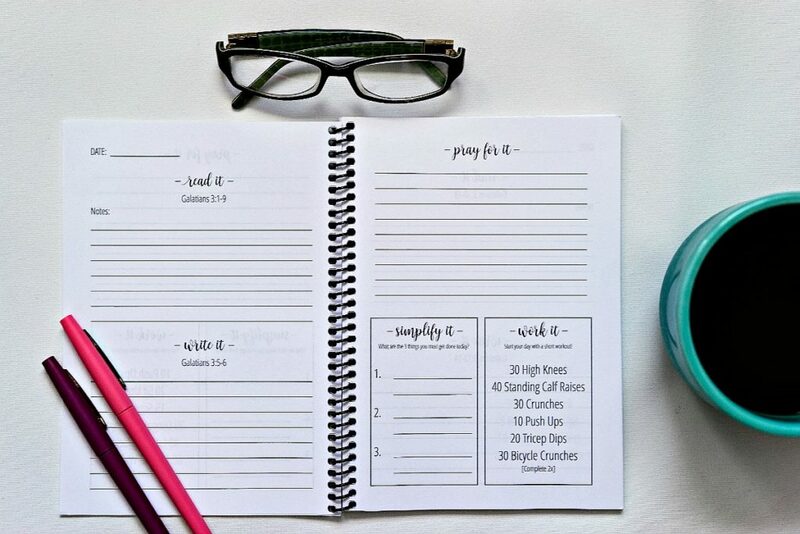 The Simple Start Journal is meant to be used Monday through Friday, and this first one should last you for seven weeks on that schedule. Getting focused on your priorities: You’ve given a question to answer & space to note your three most important tasks of the day. Getting a short workout in: You’re given a short, simple workout to complete each day. These workouts can be completed with no extra supplies – just your own body and a small space. There’s a different workout for each weekday! 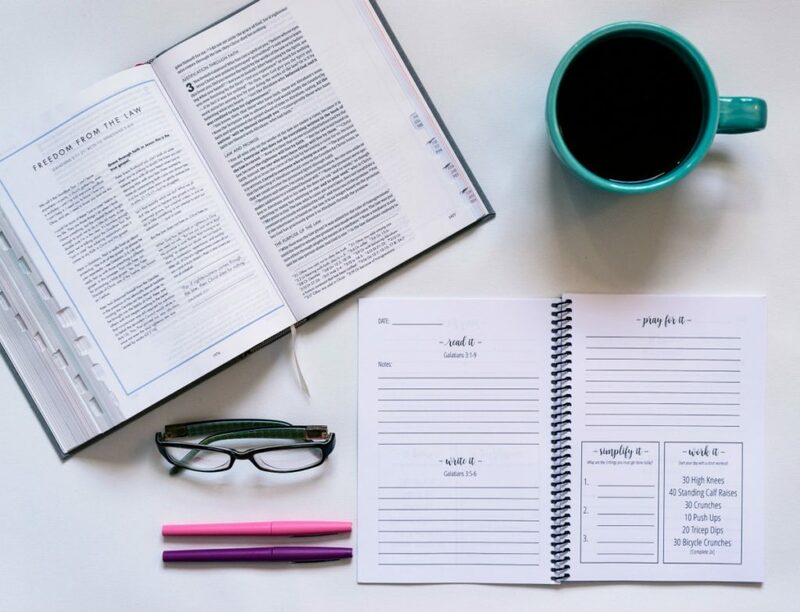 Instead of juggling a basketful of tools, The Simple Start Journal is one comprehensive resource that covers all areas of a simple morning routine: reading & writing Scripture, setting priorities, and completing a short workout, every single weekday! 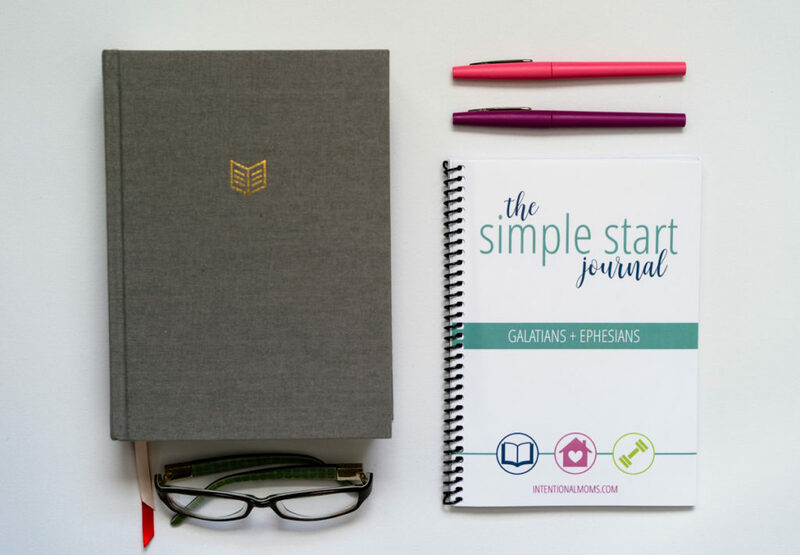 The Simple Start Journal is now available in TWO VERSIONS! The Spiral-Bound Version is printed, bound, and shipped straight to your house. It’s $15 plus shipping & handling, and takes about two weeks to arrive. Purchase The Spiral-Bound Version here! The Printable Version is a digital file that you download and print at home. You can put it in a mini binder or have it spiral-bound at an office supply store. It’s $8 and available for immediate download. Purchase The Printable Version here! Decide which version of the journal you’d like. Do you like to have immediate access & print resources off yourself? You’ll want to choose the print-at-home version ($8). Check out that version here.Would you rather have this journal already printed & bound, delivered straight to your home? You’ll want to choose the spiral-bound version ($15 + shipping). Take a look at this version here. Grab your Simple Start Journal! Choose your favorite version below & place your order! – Order the Printable Version! – Order the Spiral-Bound Version! Start your new morning routine! Friends, if you are in need of some consistency in your mornings, and some peace throughout your days, this journal is for you. Starting your mornings off on the right foot makes ALL the difference! I hope this journal + our new accountability group make your morning routines simple, consistent, and peaceful! How long does the journal last? That is, if you use it every day, how many weeks will it be before it’s filled up? Never mind, finally found it in the post! Hi Kayse, This looks wonderful! I have the same struggles and I don’t have little ones – well a 17 year old and a hubby and a desire to sleep in the morning! I was curious as to what Bible you use? I was looking at the one pictured in your post. I have ESV, Wayfinder, NIV and Message.